The holidays are quickly approaching and what a beautiful start to the season-our daughter is engaged to be married! The proposal took place under a beautifully lighted tree that actually reminds me of my logo tree. We could not be happier for them. In the midst of wedding preparations, I am busy working on the second picture book for Spark Worldwide International. It is a story about giving that I think will resonate strongly with children. It is a true story of two little girls in Columbia. I am tackling the dummy a little differently than I have done before, focusing on the main characters on each spread first instead of completing the whole scene on each spread. I hope that this will keep me connected to the characters well and consistent in rendering them. This story is a bit more challenging for me illustration wise and I love that. I can’t wait to get to the coloring stage. Other current projects included writing the second journal story in a series for girls and completing the final illustrations for an activity book. I am hoping to fit in time to send off some writing samples to at least one educational publishing company before the first of the year. My Etsy Shop? On hold for now. Yesterday I attended the North Texas SCBWI Convention in Addison, Texas. It was wonderful! I have been to many of the conventions but this one was special. Marvin Terbank was the keynote speaker. He shared about humor in children’s books and really about humor in all aspects of life. He is almost 80 and still teaching English and writing funny entertaining grammar books for children. His adorable wife travels with him. They are very interesting and kind people. Other speakers I had the pleasure of hearing were: Sally Lee (writer of over 50 educational books for children), Jan Peck (one of my favorites), Rosie Pova. Marvin Terban and his wife. On another note, I’m gathering books from my shelf to add to the SCBWI auction at the upcoming convention. Ugh, it is always so hard to part with books. Here is a one I am laying on the alter. I really love this book. Hope someone else will be inspired by it too. Then again, maybe it won’t sell and I’ll get it back, kind if like Abraham and Isaac. Last weekend, I had the opportunity to visit the Titanic exhibit at the Mayborn Museum in Waco, Texas. It is a beautiful museum with lots of interactive designs for children and adults. 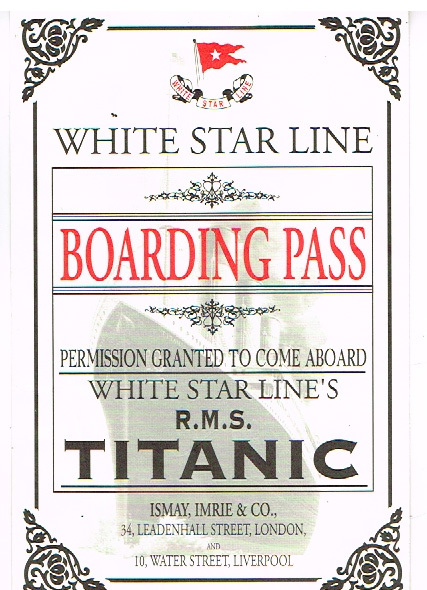 At the beginning of the Titanic tour, each guest is handed a boarding pass with a name of an actual passenger that was on the ship that fateful trip. Each pass has a little information about who the passenger was and why they were on the Titanic. Mine was Hilda Slater. She was returning from a trip to England where she had purchased her wedding dress and was about to be married when arriving in New York. She was 30 years old and had given up on a singing career funded by her brother for many years with no success. Winding through the exhibit, I couldn't help but think about Hilda, wondering if she survived or not. At the end of the exhibit, guests locate the passenger name on their pass among all the names of survivors and non survivors. The names are on a large wall. The lists are organized by first class, second class, third class, and staff. Looking at the lists visually, helped me see the devastating number of lives that were lost and made them real individual people. My passenger was one of the survivors. The staff had the greatest number of casualties followed by third class passengers who were housed in lower areas of the ship. Such a sad story knowing how easily such a tragedy could have been avoided. I have seen and read so many books on the Titanic, but this exhibit gave me some new ideas for some creative projects for kids and stories that have not been told, or at least I don't think so. Research will let me know if I am right about that or not. Researching, writing, reading, writing, research, write, read, ......... These are my days right now. I'm working on a proposal for a large writing project for children. It is a massive subject, but fascinating information weaved with real stories. I can hardly unglue myself from my office, I get so wrapped up in the writing and researching and reading. Truly excited about this challenge! I took a little break to review the new Sparky story set in the Amazon just sent to me. It is the second picture book for Spark Worldwide and I am so excited about the writing and illustrations I'll be doing. Etsy shop will only have a few hours each week right now as I am focusing on this big project. Feeling grateful for these opportunities. From a recent book I illustrated.